A stunning FSC oak floor finished in our own eco-friendly hardwax oil. These are wide and long boards ranging from 120, 140, 160 to 180mm in width and 600 to 2000mm in length. All these boards are 20mm with a tongue and groove on all 4 sides and micro bevelled. The floors are packed in 2 metre length boxes. Prefinished floors are ready to install and do not require sanding or varnishing/oiling. Our prefinished floors save on installation time and keep mess and inconvenience to a minimum. Because these floors are oiled and sanded in the factory 3 to fine level they have a smooth silk like texture. There are two grades rustic and prime. 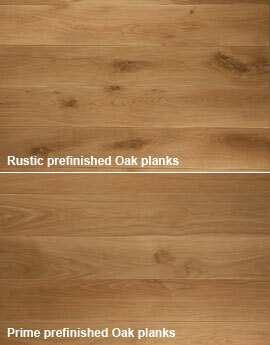 Rustic has a natural wood appearance with variation of colour and knots of various sizes up to 50mm. No open knots.